I've been participating in F2F Workshops on the Integration of the Internet into the English Class and learning soooo many things that I need to 'put pen to blog' to save some of them. 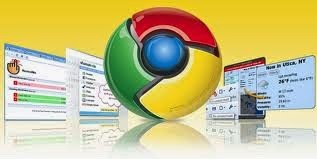 Today we've been surfing Chrome extensions - awesome tools to help us improve personally and professionally. I can only find advantages -no difficulties, at first sight. Google offers from Google dictionary to Awesome Screenshot ... for free. I've mentioned only these two as they were my favourite and the ones I've been experiencing with. Google Dictionary allows users to quickly check any word's meaning by just clicking on it - wherever the site it appears. Awesome Screenshot has made my life much easier by replacing the combination of 'ImprPant' key + Paint to edit pictures I take from my screen. Being an online teacher, I make screeshots many times a day, so I find this extension vital. I believe that the most valuable help that these tools offer us is saving time - which is essential in today's society and with such a demanding profession as teaching is. Good start, Adri!!! Maybe you could add a brief description of your favourite extensions to keep a record?